'BOWLER ANIMATIONS give players the natural cues they need to get ready for each shot and releases all their normal batting triggers,' is how MCC Head Coach Mark Alleyne described the innovations introduced by the new 'TrueMan by BOLA' Bowling Machine. 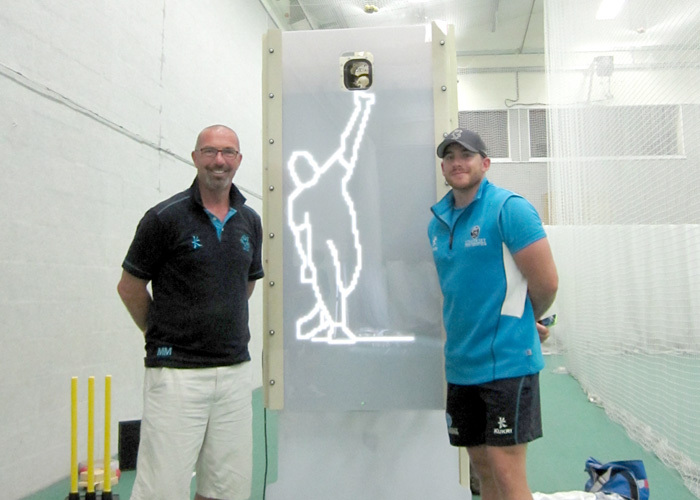 The TrueMan displays a high-contrast LED animation of a bowler on the front of the Bowling Machine which synchronises exactly with release of the ball. TrueMan was developed from bowling machines designed by BOLA that incorporated projected images of bowlers for SMAAASH, an Indian company operating twenty lane cricket centres in an entertainment environment. For club and professional cricketers projected images are only effective in low light levels and as all serious cricket practice always takes place in well lit circumstances BOLA had to find an alternative. The answer was a mono, high-contrast LED screen that works in well lit cricket facilities as well as outdoor nets. "The bowler animations are all legitimate bowling actions that encourage the player to employ the right batting sequences and make cleverer decisions," said Mark Alleyne. The bowler animations are produced by artwork made from real life video footage and so an extensive library of actions and styles of bowling can be built up with any player's action being able to be reproduced. "Working on the BOLA machine as a batsman is something we do all day and every day and to put a different component to it makes it a little bit more exciting and a little bit more real," says Nick Compton. The TrueMan is electromechanically active and programmable by any Wi-Fi enabled device (tablet, phone or laptop) by downloading the BOLA app. All the machines functions (line, length, speed and swing) can then be manipulated and saved as individual balls, overs or spells. They can then be used as selected or 'shuffled' to produce random sequences. The bowler animations can be changed at any time and can be matched with any number of deliveries. If you choose not to pre-programme each delivery a random variation of speed, line and length can be programmed. "I would definitely recommend it to club cricketers and guys willing to get out there and practice facing different types of deliveries and also not being able to set up to a particular delivery," said Nick Compton. "I think it's great that you can actually get that visual, really see that guy running in and get your timings from that." The TrueMan can be speedily set up by one person and can be easily wheeled through a normal one metre doorway. The Machine's frame will compress itself to fit under a standard 2.05 metre door height so that storage away from a playing area is never a problem. A new 'elevator' feeder system has been developed to maintain the machines storage height but it also removes the feeder (or any other visual interference) above the image of the bowler making his run up. "It is important for young cricketers to see new technology coming into the game that is relevant to them," said Nye Williams, MD of BOLA Manufacturing. "If you give the controlling device of the TrueMan to a young player, they understand immediately, there is no questioning of the technology and they just get on with it." "The TrueMan has been enthusiastically received by all the players. At this time of year, early in the season, it is the perfect tool for developing strategic practice where we focus on batting strategy rather than batting technique," said Mark Alleyne. "Many of the players are doing extra sessions since the arrival of the TrueMan. The wicket keepers in particular seem to have taken to it. They can set the machine up and practice by themselves." 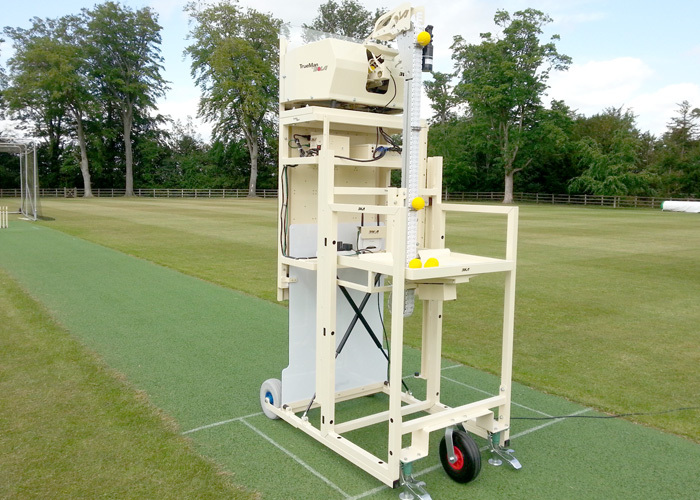 The England and Wales Cricket Board have bought twenty TrueMan by BOLA Bowling Machines which have been installed at all the First Class County Clubs and the ECB Academy at Loughborough.